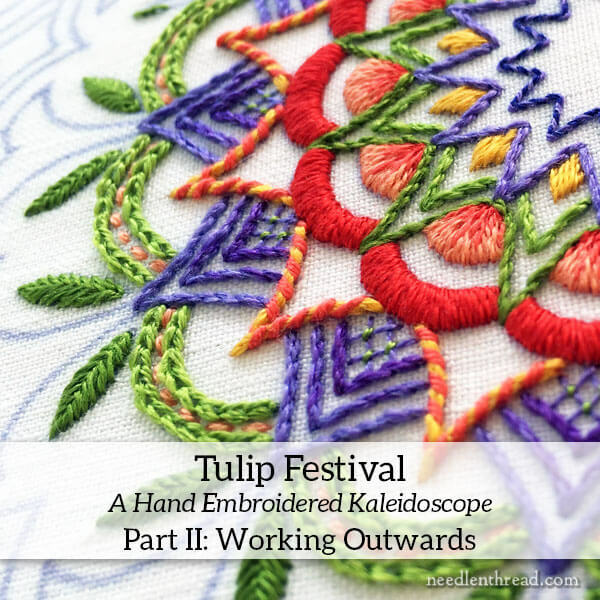 On Monday, I shared the beginnings of Tulip Festival, a Hand Embroidered Kaleidoscope. We looked at the project set-up and embroidering the first center layers of the design. 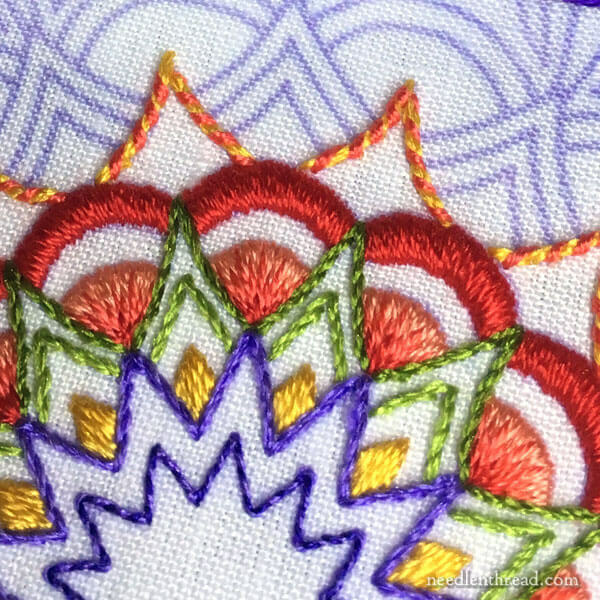 Today, I’ll take you through the next several layers on the embroidered kaleidoscope, discussing embroidery stitches and colors. I’ll also talk a bit about thread substitutions, and share some tips! We left off on Monday at the wide layer of red satin stitched scallops. I mentioned that you could stop at that point in the design, and have a nice little medallion that would make a pretty ornament. Well, there are several places on this design that make a good stopping point, if you’re keen to stitch something smaller than the original pattern. You’ll see that as we go along! We’re going to work through the next seven layers of the design in this guide. Well – it looks like seven layers on the original design, but when they’re all stitched in color groups, it works out to about three. Just beyond the satin stitched scallops is a layer of points in gold and coral. This layer is whipped backstitch, using three strands of yellow-gold (2525) Soie d’Alger, whipped with two strands of coral (924). If you want more yellow to show through, use one strand of coral. First, you’ll want to work the backstitch foundation on each pointed element around the layer. Use a #7 crewel needle (or larger) when stitching with three strands in the needle. When moving from one point element to the next, you don’t need to end your thread. Just turn your work over and run the thread under the back of the satin stitched scallops to the beginning of the next point element. 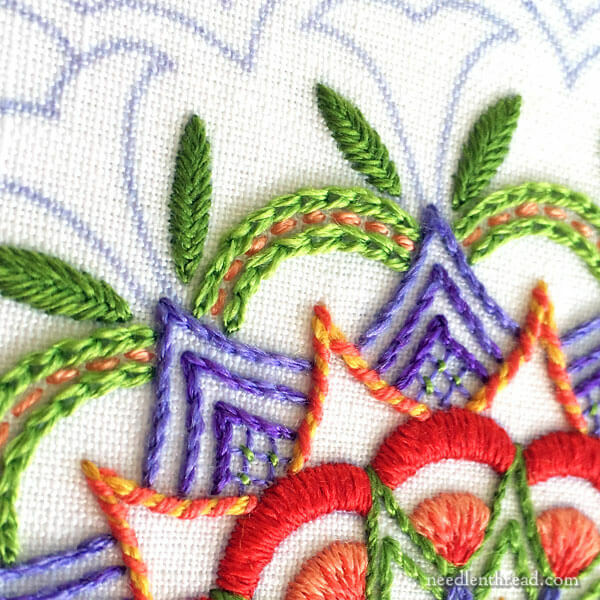 To come to a sharp point with backstitch, the concept is the same as when working to a sharp point or corner with stem stitch, as explained in this tutorial. Even though you can embroider a good distance with the same thread in this design, I suggest keeping your thread lengths no longer than 16-18″, and changing threads as soon as the thread begins to look worn. If it starts looking dull or a little fuzzy, that’s a good time to start a new thread! 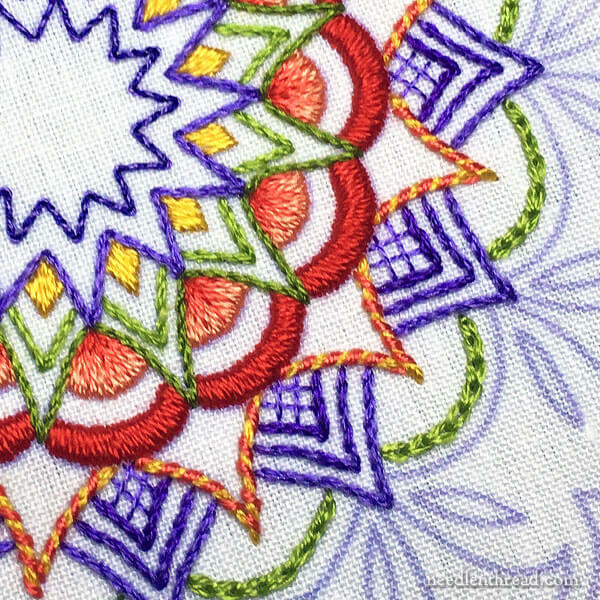 Once you’ve finished the backstitch, switch to a #24 tapestry needle and thread up two strands of the coral, to whip the backstitch. The next layer is actually a group of three layers – the three blue pointed elements. Working from inside to out, you’ll see an area filled with a couched lattice filling, edged with a stem stitch line. The next two lines out (also in blue) are also stem stitch. To gradually increase these layers in thickness, I added more strands of floss. Notice, too, that they are different shades of blue. They aren’t, however, three shades of blue, so let’s look at how that was done. First, worked the lattice using one strand of the lightest blue (1334) couched at the intersections with one strand of the lightest green (2124). Then, work a stem stitch outline along the outer edge of the lattice area, on the design line, using one strand of the medium blue (1335). Work the next outer layer of stem stitch with two strands of Soie d’Alger – one 1334 and one 1335 in the needle together. Work the final layer of blue in three strands of the lightest blue (1334). For lattice filling, check out this video on lattice stitches. You can also check out these tutorials on couched lattice fillings: Doodling with Lattice Fillings and More Lattice Fillings. For stem stitch, watch this stem stitch video and read about how to turn sharp corners or come to a point with stem stitch. You can also read up on stem stitch shading techniques in the article linked to above, about corners with stem stitch. The next layer out on the kaleidoscope is made up of two lines of chain stitch scallops worked with two strands of Soie d’Alger in light green (2124). Between the two strands is a running stitch line in medium-light coral (923). Check out this video for chain stitch. This video for running stitch will help you master this simple stitch. And you should definitely make sure you’ve stripped (separated) your floss before working both stitches, to give the stitches their best chance for a nice, full coverage. This is another place in the design where you could come to a screeching halt and call it finished, and it would look great! But… let’s forge on! While you’ve got your green silk out, thread up two strands of Soie d’Alger in dark green (2126) – or medium if you prefer – and work the leaves in fishbone stitch. You can find a video for fishbone stitch right here. It’s a classic leaf filling stitch, very easy as it’s comprised only of overlapping straight stitches, and it looks great on leafy shapes! And that brings us to a good stopping point! Next time, we’ll tackle the long and short stitch tulips… and a couple more layers! You can substitute cotton for the silks I used in this design. One strand of Soie d’Alger, in weight (or thickness), equals about 1.5 strands of DMC cotton. The silk has a much nicer “spread” to it, thanks to its soft twist, so it actually covers better than the cotton, and it works tremendously well for the upcoming long and short stitch shading on the tulips, which is one reason I preferred to use silk on this project. That said, you can use cotton. If you want to keep the color scheme (more or less – it won’t be exact), you can try using a Soie d’Alger to DMC conversion chart to select colors. I’d suggest checking out this ever-developing list on Hands Across the Sea Samplers. 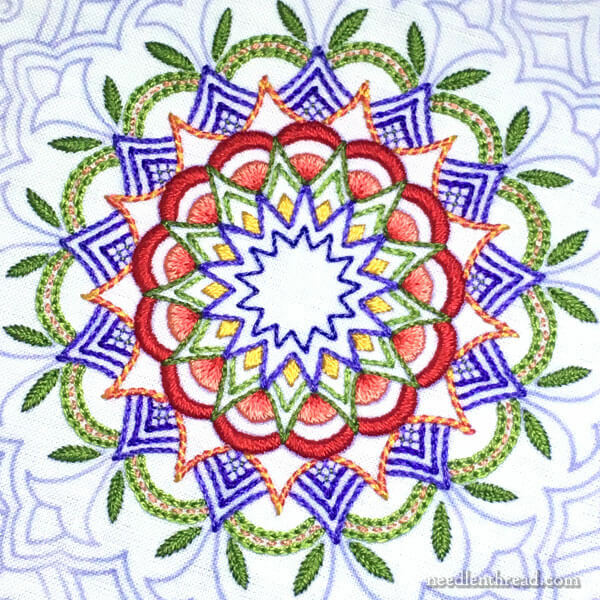 If you want to stitch along with this series, you can find the pattern for Tulip Festival in my e-book Favorite Kaleidoscopes, here. Tulip Festival, Part I: Set Up, Materials, and Beginning to Stitch – this is where we talk about fabric, threads, colors, embroidery design transfer, and tackle the first seven layers in the center of the design. I will eventually group all these articles in this short series into an index so that you can easily find it when you’re ready to stitch up your Tulip Festival kaleidoscope. If you have any questions, feel free to ask them below! November 20, 2017 Tulip Festival Part IV – The Finish! A great selection of stitches and colour threads on the Tulip Festival design and you wouldn’t get bored with the project and with your very informative instructions I’m sure it would be an easy project to follow, especially when you have grouped all the articles together in one place. Thanks for the instructional work you have done on this for us and for all your links which will aid the embroider in this project and for the tips and techniques, it’s a great design. You have given me an incredible gift in sharing your design and stitching tips. My heart is filled with such joy! I don’t know how to do crewel work and I am going to learn. Your design is absolutely gorgeous and your method of teaching is just so simple and informational and well-written. I am in awe. I also know it is harder than you make it sound so i need to practice on a smaller project before tackling this but stitching this is now on my bucket list. THANK YOU soooo much! 2018 is my year to learn crewel and stitch this! Mary I love the lattice stitch in here. It’s really striking next to the chain stitch. projects, all one one tote. I’m thinking of using a Finca Cotton Perle on linen, so that it washes, or a nice Valdini. I did two bags last year. Both of them needed washing after a year of be lugged around to EGA meetings. Hi, Holly – I didn’t finish the tote (yet)…it’s a matter of conquering the sewing machine, which doesn’t, in general, like me very much. I plan to get to it one of these days, when I have a good while to sit down and figure things out. I suppose it’s not just the machine – I have to feel my way through the construction of it, too. Hi Mary, I have purchased your E-book mainly for the Party in Provence as I just loved it. Are you going to tell us all the threads and stitches you used for that too. I do hope you are! I wish to do the three kaleidoscopes and mount them in hoops as I think they would like spectacular as Hoop Art. I am not good at choosing my own colours or stitches and as I’m getting older I just like it when someone like you has done all the hard work. Thanks, Mary, for the photos and directions for “row by row”. This is incredible to “see” how this developed from the center to the next set of rows…and what stitches/colors that you used for each new area. I look forward to seeing more photos and directions moving this ever outward toward the edge! Not a question but a comment – and a huge thank you! I’ve been agonising what to give my niece for a wedding gift. She lives in Switzerland, the wedding is in New Zealand and I live in Australia! Then when you started this tutorial on the Tulip Festical Kaleidoscope, I was hooked! I think it will be a beautiful gift if I can pull it off! I have bought the e-book already (thanks for your help), I have the linen and materials, so hope I have the skills. You have supplied the incentive and wonderful step by step instructions, complete with masses of tutorials! So, thank you for your continuing inspiration. Sounds like a great idea, Clare! I’m so glad you like it!